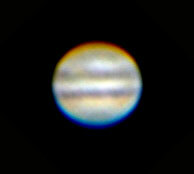 This is the very first time I have taken Jupiter, and the conditions were not very good. I had a very short slot of time to get set up and take the movies, Jupiter was very low in the sky, between buildings, and there was lots of atmospheric turbulence, and also some very light cloud cover. I used K3CCDTools to capture AVI footage of the planet as it passed across the field of view of my Orion XT10i telescope. Note that the XT10 does not have equatorial tracking, so I cannot do long exposures, and the time to do a capture is limited to about 35 seconds at prime focus, even less when a Barlow is used for higher magnification. Here is a link to the footage to give you an idea what the original AVI looked like, although this has been compressed and reduced in size for a quick download, so it’s simply to give you an idea of the view through the telescope and the speed at which the planet traverses the field of view. The webcam Exposure and Gain have been adjusted down so that the planet does not get overexposed, and this means the orbiting moons can no longer be seen. Original source movie for Jupiter .mp4 - requires Quicktime or similar to view. Next day I used K3CCDTools to align, stack and process the image. I find that using the post-processing in K3CCDTools to adjust the Channels and Gamma helps brighten or darken the image just a touch, but it is the Unsharp Mask that really makes the image “come alive”. I use a Radius of between 4 to 7, Threshold doesn’t seem to have much effect on this small image, and Strength of anything between 500 and 800. This is probably overcooking the settings on the Unsharp Mask, but it does make the planet look a bit more as expected with such a dull movie source. I then used Photoshop CS2 to rotate the planet image to horizontal, and apply a little bit of Levels and Curves adjustment. And these are the resulting images taken from 2 more captures. Not too bad considering the quality of the originals ! its amazing what K3CCDTools and Photoshop can do. 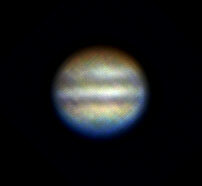 Maybe if Jupiter had not gone behind my garage, then I would have been able to use the Barlow and get a bit more detail and closer in. This entry was posted on Saturday, July 5th, 2008 at 4:11 pm	and is filed under XT10. You can follow any responses to this entry through the RSS 2.0 feed. You can leave a response, or trackback from your own site. Good work there - the final image compared to the .avi source is a huge difference, you’ve got a good amount of detail out of it. Amazing what stacking can do, isn’t it! Spam protection: Sum of one + seven ?